In November of 1999, photographer David Crosby set off on a dream trip; helping to pilot a 42' Grand Banks trawler 1,300 miles down the Intra Coastal Waterway from Oxford, Maryland, to Sarasota, Florida. He only had two weeks to make the trip, as he'd promised his family that he'd be home in Greenville, South Carolina, for the Thanksgiving dinner. David's two week long running conversation with Captain Rick, the boat owner's representative, turned the trip into something else. As they shared stories, Rick told of his travels and troubles, and David of his decades long effort to bring happiness to his wife Jenny while still leading a fun and exciting life along the way. From poverty to a clash with the law, college to success, living in a plantation house, a synagogue, a houseboat, a log home and a farm, Crosby's candid story of his never ending efforts to fulfill Jenny's dreams fill the long hours of driving the boat. Only after telling the whole story during the two week cruise does David realize that he will never make his wife happy. Only she can do that for herself. Part travelogue and part memoir, this engaging story of adventure and challenge is filled with the craziness of being a commercial photographer in the 80's and 90's, and of the difficulties of trying to make someone else happy. It's a journey worth taking. The book includes a link to a web site containing photography from the ICW trip and from other stories included in the timeline. David Crosby is a commercial photographer in Greenville, SC, and a long time lover of boats. As a photojournalist for 8 years and owner of Crosby Stills commercial studio for the past 28 years, Crosby has traveled the country shooting ad campaigns for Michelin, Agfa, Mount Vernon Mills, BMW and numerous other clients. Crosby's love of boats began with a 16 foot runabout and has lasted through four houseboats and a cabin cruiser. 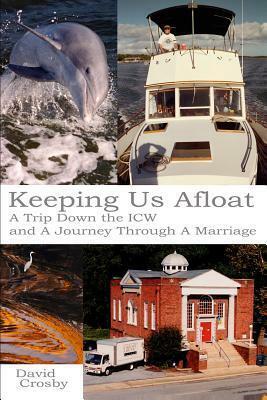 The book "Keeping Us Afloat" is set on a two week trip down the ICW from Maryland to Sarasota, Florida on a Grand Banks trawler. Crosby also has a life long love of travel and of living in interesting homes. He's lived in a plantation house, a 1929 synagogue, a house boat, a lakeside log home and a farm among others. Writing is a passion he developed as a journalism major at the University of Georgia, where he earned an ABJ in Magazine Writing. Photography took over his life in the meantime, and it's only in the past year that writing has re-emerged as a focus in his life. A voracious reader, Crosby lives in South Carolina with his wife Marilyn, a Lutheran Pastor.